Micro surfacing is a polymer-modified cold-mix paving system that can remedy a broad range of problems on today’s streets, highways, and airfields. When the scientists used highly selected aggregates and bitumen and then incorporated special polymers and emulsifiers that allowed the product to remain stable even when applied in multi-stone thicknesses, the result was Micro Surfacing. 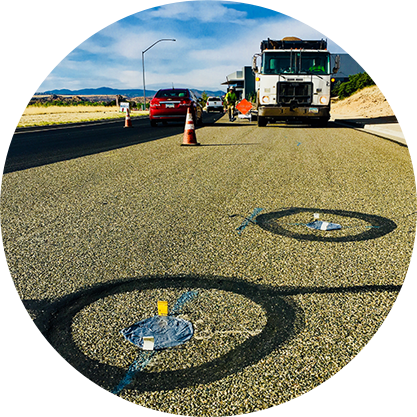 Introduced in the United States in 1980, Micro Surfacing now is recognized not only as the most cost-effective way to treat the surface wheel-rutting problem, but also a variety of other road surface problems. Micro Surfacing is now used throughout Europe, the United States, and Australia and is making inroads into many other areas. How is Micro Surfacing made and applied? Micro Surfacing is made and applied to existing pavements by special machines, which are designed to carry all components, mixes them on site, and spreads the mixture onto the road surface. Materials are continuously and accurately measured, and then thoroughly combined in the machines’ mixer. As the machine moves forward, the mixture is continuously fed into a full-width “surfacing” box which spreads the width of a traffic lane in a single pass. Or specially engineered “rut” boxes, designed to deliver the largest aggregate particles into the deepest part of the rut to give maximum stability in the wheel path, may be used. Edges of the Micro Surfacing are automatically feathered. The new surface is initially a dark brown color and changes to the finished black surface as the water is chemically ejected and the surface cures, permitting traffic within one hour in most cases. Successful Micro Surfacing incorporates carefully selected materials, scientific mix designs, advanced technical specifications, and problem field practices. 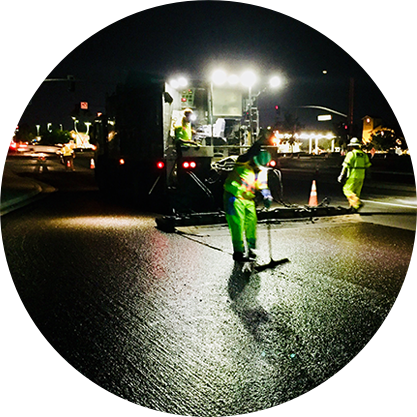 Micro Surfacing begins with the selection of high-quality materials – asphalt, aggregate, emulsifiers, water, and additives – which must pass special laboratory tests, both individual and when combined, as a Micro Surfacing system. Using various design mixes, techniques, and equipment, micro surfacing can be used successfully in these situations. 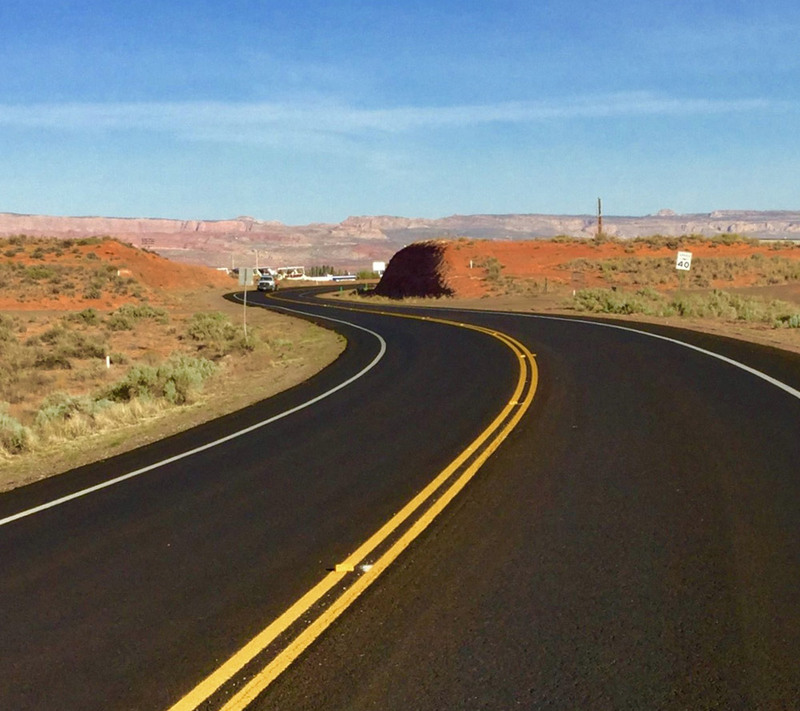 In quick-traffic applications as thin as 3/8 inch (9.5mm), Micro Surfacing can increase skid resistance, color contrast, surface restoration, and service life to high-speed roadways (interstates and autobahns). Such projects are often reopened to traffic within an hour. On airfields, dense-graded Micro Surfacing produces a skid-resistant surface without loose rock that damages aircraft engines. As a thin, restorative surface source on urban arterials and heavy traffic intersections, Micro Surfacing does not alter drainage; there is no loss of curb reveal. Micro Surfacing is applied to problem sections of roads or runways to eliminate hydroplaning problems that occur during periods of rain. The Micro Surfacing restores the proper surface profile and makes the area safe to use. Because Micro Surfacing can be effectively applied to most surfaces at 3/8 inches (9.5mm) or less, more area per ton of mix is covered, resulting in cost-effective surfacing. Micro Surfacing creates a new, stable surface that is resistant to rutting and shoving in summer and to cracking in winter. Applied to both asphalt and Portland cement concrete surfaces (usually preceded by a tack coat on concrete), Micro Surfacing is often used to restore a skid-resistant surface to slick bridge decking with minimum added dead weight. Used as a scratch (leveling) course, to be followed by a surface course, Micro Surfacing can provide transverse surface leveling. 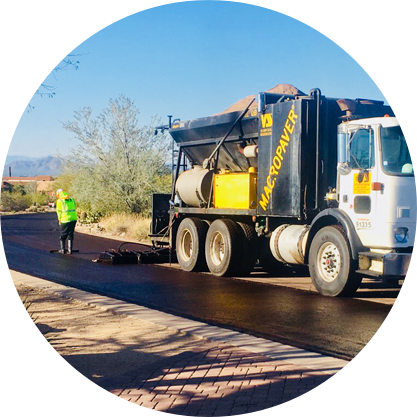 Because of its quick-traffic properties, Micro Surfacing can be applied in a broad range of temperature and weather conditions, effectively lengthening the paving season. It is particularly suitable for night applications on heavy-traffic streets, highways, and airfields. Applied at ambient temperatures, Micro Surfacing has low energy requirements. And it is environmentally safe, emitting no pollutants.